When I review this ‘fiction’, my thoughts will appear in the comments stream below… (My reviewing queue of purchased publications is growing longer and I don’t expect to catch up until late October). The Sound of White AntsIn "Brian Howell"
Although this is not my normal practice in fiction reviews but — based on my past experience in reading this author’s exquisitely crafted novel about Vermeer, The Dance of Geometry — I suggest you google ‘Jan Torrentius’ just to get a flavour for optimum returns. Not too much googling, though, but just the bare minimum to centre your callow self in the era and ethos. These first passages in the book do not disappoint the hopes of any reader of that earlier novel, the prose style imaging and characterisation being as if from a camera obscura created by the inner dome of a vast cathedral but with finely meticulous results and any eroticism being sufficient to make you blush with embarrassment or blood pressure. I am truly astonished by this text so far, the holding fast of its passing images, Jan’s first person backstory, the conspiracies, the collusive couple with whom Jan constructs both finely vesselised art as well as sweatily entrancing the female half, the alchemy of painting, the cruel appropriation of animal eyes, devices such as camera obscura and torture instruments, the name-dropping of historical figures, your trying to hold fast to all these images real and fictional and magickal through the Howelling eye. All my real-time reviews are based on my first reading of any book. My stream of consciousness has already turned to torrent. This book is something special. I will read it, indeed relish reading it, real-time reviewing it at first vesselised sight, as you will, callow though you be, even if you mete out the days to try slow its torrent, or will it let you? Think Jonathan Strange and Mr Norrell? I am now seriously trapped by this book, but I still intend to try stem its torrent. Now, we have the engaging penned view of Jan Torrentius by a historical third party, and the language and hints continue to accrete as to his nature, as a salon painting competition impends (still to be resolved), a competition or artistic duel stemming from a most intriguing demonstration of a street view by camera obscura, all imbued with a sense of magick, tricksy silences, comings and goings, amid a tangible 17th century historical ambiance plus a real poem by one of my favourite poets, Donne. And wordplays upon stream and torrent, brook and flood. …or History embracing me, with all its truth and reality as well its reflected contrivance via eyes that are not mine, primary sources notwithstanding. This book is astonishing, really, in its ability to divert linear truth by curtains over doorways (cf my view of ‘Tristram Shandy’) as well as by mirrors or camera obscura, with digressions that, we are told, are destined to return to the stream’s source however much they torrent off course. And the painting competition plot machinations do in fact move on and act as a structure upon which a vision of historical time and metaphysical conceit are magically poured or meticulously brushstroked or wildly daubed. A great fiction book is a sort of diversionary instrument – forming digressions from the otherwise inevitable audit-trail of your life – a device to distil truth from paradox upon each and every occasion in your life you happen to read such a book. This book promises to be an optimum version of such a cunning contraption, I feel. So, yes, I am not only ‘not disappointed’ by the painting competition’s outcome, but also decidedly inspired by its uniqueness and by its on-going mechanics of characterisation as part of a modernistic ‘happening’ filtered through 17th century sensibilities. A filter working both ways between now (a ‘now’ with this book first published in 2014 by luxurious sleight of hand) and then (a ‘then’ whereby, say, Donne still lives and writes poems even while I write this). Which made me think, in tune with the comma as device in “Mobile, Phone”, that the alchemy of painting in this book could travel by sound as well as by light? Meanwhile, on a saner note, this is the start of the third and final section of this book, a new narrative angle coordinating truth in this fiction from a new point on the globe of 17th century civilisation, forming the aforementioned ‘triangulation’. Yet, I believe this book is Volume One of triangulating Torrentius and who knows yet what might be further triangulated of him within whatever hologram of sight and sound the yet unpublished next volume may already hold? A stream and torrent, as in all riparian matters, are surely sound as well as sight, but each does not exist as the same structure of object to see or hear from one moment to another. Text, when mimed or mouthed upon reading it, is surrogate sound, I suggest. This book is full of contraptions, contrivances, devices, and you need to hold fast to yourself as reader to avoid becoming their puppet or doll. For example, I had to shake off the sound of the bubbling devices of experiment in the Alec Guinness film about a Man in a White Suit when now learning of the properties of colours and how Torrentius operates them. 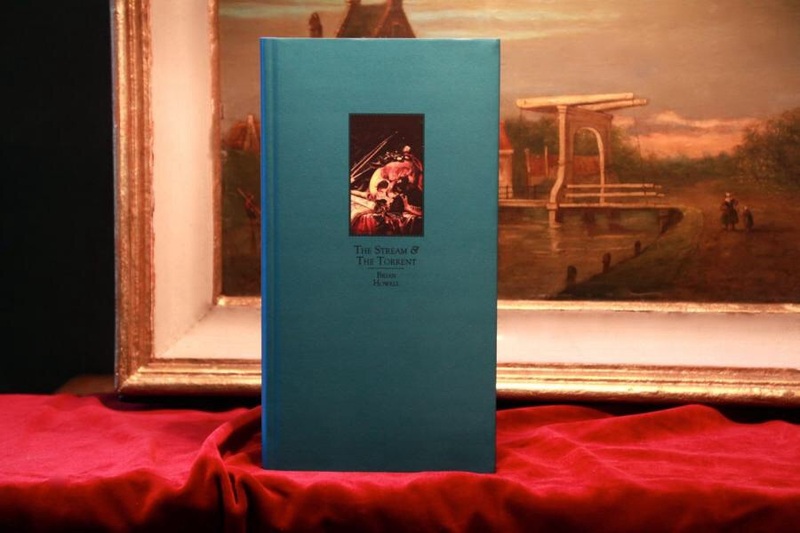 This book remains more sight than sound, but one cannot discount the Royal conspiracy that involves, I infer, codes relating to the Rosy Cross via Music, the sounds in the ears when in an underwater rabbit-eye vesselised craft using the riparian Thames as stream or torrent under the narrative bridge …. and (Toyn)bees as music. A book of place as well as time, with London, Prague, Amsterdam forming well-historicised genii loci… a legerdemain ‘mobile quality’ with exquisitely crisp but tessellated prose, and a political historomancy of a plot in which Jonathan Strange and Mr Norrell might once have been implicated as I earlier predicted – and a device for the hatching of eggs without hens, a book within a book as a hen and egg conundrum, with a promised creation of a double yolk that is probably even more legerdemain de L’OUBLI than this one! A Book of Tricksy Philosophical Aesthetics. A prestidigitator’s booth or cabinet to enter, but beware, by just opening its door you will never know if you’ve entered it, but if you have entered it, you will never know whether you have left it. Please see further sub-comment today just below the next main comment. Above I have typed the order of what I idiosyncratically call Volumes, but this is not the order of Parts of the gestalt work itself. Eventually, please see the end of this review below when I will re-review Part Six (Vandike and I) to complete my dreamcatching. My predestined hawling. Not that is essential or even advisable. And I regretted not to approach this book as a tabula rasa. But why the missing r in this part’s subtitle, missing on spine, cover and title page? We follow, via a written statement of a hard done-by participant (once a suspect in the gunpowder plot), the (King Charles) surrounding circumstances in the resurrection of Jan from prison, Jan’s shackled mien seen there, comparison with Rubens and the Jan painting that one can see on that Wikipedia. Gorgeous description of that still life with shadows and brinkish effects and the fact Jan was a poorer painter at human figures. But how can we judge? Where are these paintings? This book will give you these images in the mind’s eye, I am confident. If only by osmosis? Above photo of back cover demonstrates and implicitly explains the aforementioned missing r.
Alternative facts or too many truths to cope with, as gout-fearing Lord Dorchester, on behalf of King Charles, continues to tell us of his first impressions of Jan in prison. Jan says he likes pulling people’s legs, then is delivered a chicken leg to eat while the statement talks of seeing something wrong with one of Jan’s own legs. Heresies and sects, Christian religion seems to me to be on the brink of Devilry anyway. I am beginning to like both these characters as filtered by the words of one of them. From Correspondence with the King etc, and Dorchester’s account of conversations, we gradually build a scenario here, fraught with innuendo about Jan, including reference to Rubens and Descartes, and other proclivities. And the art business at that time. Mention of Rembrandt seems germane, too. I leave the text on a cliffhanger as the paintings are about to be viewed before bed. I thought maat or ma’at was a part of some mystical religion of holism or gestalt, similar to my own. And Maastricht the beginning of the curse of Braaxit? I follow Dorchester as he looks at these still-lives for real and then sees them again but differently as part of his dozing dreams. There is more going on here than meets the eye. A mystical politics of our history in Europe that was once evoked for me by the tenantless church interiors by Pieter Saenredam I once saw in Haarlem, and the organ music I heard in St Bava church. Complexity created by static simplicity and shadows and reflections. And rituals of fiction like those of Damian Murphy. Constanter’s letter Feb 1629 to Mr Carleton (aka Lord Dorchester). We receive dark hints about Jan, via various sources, such as this letter. Implicating ‘cheating’ with a camera obscura to create the painting in question (the painting viewable on that Wikipedia to which I linked earlier) rather than by occult means, or perhaps by both these means, and yet others? The comma after ‘enlightenment’ seems significant. No plot spoilers from me, but it’s more a plot as in Gunpowder Plot as in any story plot that I try to protect from you. My visit to the Curious House of Massa, meanwhile, takes on its own chiaroscuro miracles of vision, but which are dreams, which real? You will not credit some of what I have just been through, including my now doubtful possession of the Jan painting that I showed on my Facebook yesterday for all my friends under Jan’s real name. The book volumes and their numbering are complicit, too, I guess. Anyone have the six volume boxed set, instead of my purity of first editions? Has any of the text been changed between the various versions? The end the beginning, the beginning the end? Every comma needs to be accounted for. And are we all, by sublimation, being invited into some Torrentius movement to obviate the effects of our world condition today? The start of this ‘diary’ by Elizabeth Stuart, Queen of Bohemia, seems to indicate the importance of gestalt real-time reviewing with regard to this, Howell’s continuing scatterology of Torrentius. But I keep my powder dry. There will now be an expected week and a half’s soft brexit, not a hard border, that is, a break in this review while I and my companion travel on supposed holiday to I tell you not where…. Like Elizabeth and her companion, I feel as if I have just witnessed a dream of mixed strangeness and familiarity in the last few pages. Yet riffling back, it is still all there, including what seemed like a giant beetle in slow progress up a wall. Whether this is the author’s dream or her dream or something induced by the other characters’ machinations of masque or some Rosicrucian spell, I am unsure. …as we all do, when meeting Torrentius in this increasingly momentous set of books. Still with Elizabeth’s account of the ifs and buts of history around her, deploying her connections with our own Gunpowder Plot and the consorting with machinations of who would be the Holy Roman Emperor, and the merging of all religions as one, and here further Muses, mazes, masques (mosques? ), mandrake-like shapes (cf Donne), perspective-boxes and other contraptive miracles featuring a castle within a castle, perceived horrors within such contraptions of a special reality. It is easy to forget Donne’s sermons for his poems. I have studied them both. And now this exquisite ‘diary’ of Elizabeth gives equally exquisite, exstatic prominence to the sermon he gives in her presence, the apotheosis of ‘now’, the words of which satisfyingly seem to describe, for me, the nature of my own dreamcatching/hawling gestalt of real-time reviews, many reviews over some years now (such as this one) and their philosophy (a philosophy specially created for eventually hawling this very Howell work as culmination? ), plus the gestalt of garden, here, her own garden, seen through her new eyes and thus ours, too, and much else concerned with ‘salvation’ and the thrust of this visionary rite of passage that any reader of this book and thus of her diary will experience, a balm for my own old age as I approach death. Exalted exultation. Geometrical patternings. Any political machinations. Notwithstanding. Donne’s own 1630 statement addressed (like a poem, sermon, or diary?) to this book’s curiouser and curiouser Constanter seems to start here, with its own perspective-box of the meetings of Elizabeth, Torrentius et al in the aforementioned gestalt of garden. I am absolutely entrammelled. No way out for me from masque, muse or maze. Or hidden Donne poem that I did not know existed? Even a book review has its mazes or muses, sometimes inimical ones? Some tantalising experiences that Donne allows Constanter to share, and us to share, too, by dint of his diary’s publication here via the Howell hawling of it, as Jan and others take Donne’s own dint through dents of both worry and inspiration, with some magical connections with our own times as well as to 17th century history. Creating a new religious force for whatever they deem is good. A channelling of a ritual-literary Damian Murphy approach to revelation and spiritual development, or the Brian Howell source of such phenomena being channelled by Murphy? Neither having read the work of the other? Torrent to torrent without knowing the source at all? “‘You need not worry. I know it is not witchcraft,’ I stated confidently. But is this book its own deflection from the real Torrentius role? A multiple bluff? As were also Donne’s sermons? And a geometry in his mind of a naked woman’s triangle….? Residual meetings before Lucy conveys to Donne and thus to Constanter and thus to us of what happened in Greenwich later, to which these events were rehearsal. This whole scenario reminds me of a blend of a Retoration Comedy. Or Mozartian opera with masks and overhearings and duplicity. AND with an insidious sort of Kubrickian EYES WIDE SHUT. Two wholes, one gestalt, the muscle memory of creating paintings that somehow already exist.